Nowadays when you see a three-cornered hat with a pointed front and a feather attached, the first thing that springs to mind is Robin Hood. It’s actually kind of ironic that this style of hat is associated with fiction’s greatest champion of the poor, considering that it was originally something of a symbol of high status. Known as a “bycocket” hat, it was a popular style with both royal men and women back in the day, partly because it was an easy style to decorate with jewels and other flashy touches that let the poor folks know just where you stood. Leave it to Robin Hood to not only steal his wealthy neighbors’ money and wound their pride, but also bite their style. That is some next-level socially conscious thievery right there. You can keep the rebel spirit of Robin Hood alive in this tall, pointed bycocket hat. Made with a poly/cotton blend, this jaunty number is fully adjustable and features crisscross lacing up the front and a pair of buttons at the back. 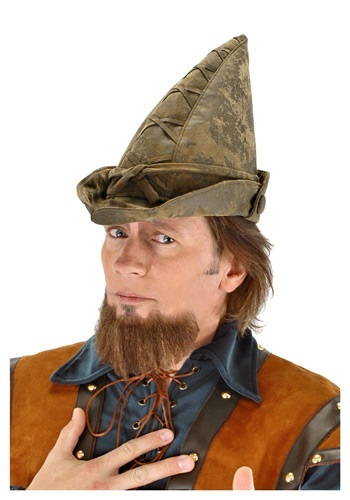 It’s the perfect topper for any Robin Hood ensemble, and it’s even better if you can get yourself invited to some super swanky costume party. Your hosts will never suspect that even your headwear is mocking them.